Share the post "Interview: DAVE HILL of DEMON"
How did the recent album launch gig go at the new venue in Stoke Eleven Music? Yes it went it really well and it is a new club launching. It was a sell out and went very well. You’ve played a few gigs recently including the British Heavy Metal (New Wave of (NWOBHM) up in Sheffield. It was sold out, over 2,000 people there.It was a privilege to play to 2,000 people, something we don’t do that regular especially here in the UK. The main ones we do a few abroad still. Like you say Demon are always a bigger draw in mainland Europe, yet it is hard to get gigs over here. Its just the way it goes. Scandinavia has always been a big one for us. It was just great to play to a couple of thousand people in Britain. 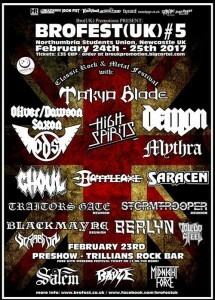 Being the NWOBHM festival we played more of the older songs. Everybody knew the words and was singing along which made a big change. 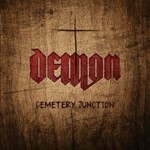 The excellent new album, ‘Cemetery Junction’ has been out a couple of months now. Have you been pleased with the reviews and fans reaction to it? I was just speaking to Mike Stone (Demon’s manager), it is probably best reaction we have had overall from press and reviews that I can remember having. One or two people have even said it most probably the best we have done, that’s not bad after all these years. It must be pleasing for yourself as a lot of bands have a classic album that they often spend many years trying to match. We always go in mean and keen whenever we record. I always have this sort of childish thing where I want to do better than the last one. It is pointless doing the same album each time. The reaction has been great, everybody has been so nice about it. It is like all out Christmases at once. We’ve had great reviews across the board from Europe all the way to Australia. The album has a lot of the classic Demon sounds from the heavier songs, through to the more keyboard led songs, that were maybe not there on the previous album ‘Unbroken’. We’ve never been one to make the same album twice. Having said that if the third album had sold 15m we’d have probably made thirteen albums the same (laughs). When we started out I always thought albums should be different, bands like Pink Floyd never made the same album twice. On this one we did draw on things that went well for us in the past, like ‘The Unexpected Guest’, ‘Taking The World By Storm’ and ‘The Plague’. All the ingredients were in there and we just wanted to make a modern classic rock album. You’ve got a new keyboard player on this album Karl Waye? He has toured and played with us in 2001. This time we have had him in band on a permanent basis. I spent quite a bot of time with him on certain songs, saying imagine this was the soundtrack to ‘Mad Max’ on the song ‘The Best Is Yet To Come’. Or ‘Out Of Control’ could be ‘Batman’. They are not actually that, but more score the track in that sort of way. We spent the time with each track to get the full potential. This late in our career I thought it would be nice to equal, and maybe exceed, our past albums. We wanted it to be heavy and commercial at the same time, like ‘Taking The World By Storm’ band ‘Spaced Out Monkey’. I have always been a sucker for a song. I think you haven’t got a song in the first place with the type of music we play then you will you struggle with the production. I always remember that as a lesson I learned on ‘The Unexpected Guest’ with the late Mal Spooner. We wrote the album and then said could we write it any better at that moment in time and we said no. I have always drawn on that experience. Mike Stone always said dig deep and then dig some more. We thought on this album can we make it any better? I have to say I don’t think in this moment of time we could have done it any better. Is it hard to get the distribution for the album as you are on your own label? We go through Plastic Head and they are very strong in places like central Europe where our bigger markets are. It works well for us. You have downloads now and the new album is on Spotify, as streaming is a bigger part of listening to music for many people now. All our albums are on iTunes and Spotify. I always find it amazing that some will spend 89p on a download of the third track on our album ‘British Standard Approved’. I would like to meet this gut who would spend it on one of our more obscure albums. I find it fascinating. You don’t have to repress anything like you would with CD’s, it is already there ready to be downloaded. You pay iTunes for a year and then you can check every other day the downloads. The great thing if you sell 1 or 50,000 you don’t have to do anything like you would do with CD’s. It is not like vinyl though as what do you get with your download? There is nothing physical. When I was kid growing up and you’d go in the record shop to see the new releases and look at the albums, the gate-fold sleeves. Now it is on a little box. Its nice to know people are downloading our music, so long as they keep buying the CD’s as well. That and vinyl helps the band. Vinyl has come back a lot now, even in supermarkets. I go to my local record store where I live in Leek and my friend has a little CD shop and he’s got lots of vinyl. He actually talks about the album and music, the first one he picks up is by Camel. we chatted about the album, the memory associated with it and when it came out. I used to work in a record shop and you gain the knowledge of the music and albums. Record shops were more than purchase places, they were meeting places for like minded music lovers. It is great to see people walking out with a twelve inch parcel under their arms. It becomes a bit of a religion. It wasn’t just about the music, it was about the whole things like the album sleeves and gate-folds. Are there any plans to re-issue the older albums and any unreleased songs/demos? Maybe a box set? There are songs lying around and there are things we want to do. There is not lots of this though, not a great vault of this stuff. We have little ideas and next year we can look at these things next year as we won’t be doing any new material. We are actually looking at doing a video in January. We’ve never done a promotional video as such before. We have a guy who we have contacted and we will most probably make a video for two songs off the album. The album is ticking along quite nicely we want to keep it ticking along. We were talking (Mike Stone) the other day about Alannis Morrisette and her album ‘Jagged Little Pill’, which was a real sleeper of an album. It took eighteen months before that one really took off. I was joking with Mike the other day saying we’ve got keep this ‘Jagged Little Junction’ going (laughs). A lot of the interviews I have been doing are just coming out now. One I did for a German magazine has just been published under the headline ‘Mad Max In Berlin’. It is a decent feature with band photos. The good thing is we have been doing really well with the initial release and the interviews are only just coming into the press now. We have miles of footage from the Sweden shows and a comprehensive DVD, plus it is twenty odd years since we did the only official live album to date. There are quite a lot of options for us and maybe pull all the bits in from the past thirty years. There is plenty for us to do other than play. A box set could be another option. We have live songs and acoustic versions we can draw together. Would you play a whole album like many bands do now? We’ve also been asked many times, particular for Germany, to play a whole classic album, which would be ‘The Unexpected Guest’ or ‘Night Of The Demon’. We have been asked to do that for the ‘Keep It True’ festival there, which basically does what it says. We will always play songs from that album, but I like playing the newer songs as well. What have you got lined up next year live wise? 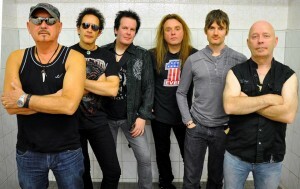 Possibility of Sweden Rock again and we have a festival in Germany in February. Brofest in February at an indoor festival. We’ve got some plans for other gigs. We’ve never played South America and we are often asked by fans there to play. I would love to play there and Japan, where we have had lots of releases and labels, and Australia. How long do you think Demon will carry on, given that bands like Aerosmith, Status Quo and Deep Purple are winding down their touring or stopping entirely? All you can do is concentrate on each year. Voice wise I am fine and I am keeping healthy. Some of the old bands are stunning live still. Jethro Tull at Sweden Rocks a few years ago were great. It won’t last forever, Lemmy has gone. As far as we go we have got to be sensible and look at the next twelve months and then see where we are after that. Thank you for all the years of standing by the band. They are wonderfully loyal. If you haven’t heard the new album please have a listen. Have a wonderful Christmas and hope to meet up next year, have a beer and have a chat. All the best. This entry was posted in All Posts, INTERVIEWS, Interviews/Rock Stars and tagged Cemetery Junction, classic rock, Dave Hill, DEMON, interviews, Mal Spooner, metal, Mike Stone, NWOBHM, rock. Bookmark the permalink.